ხელოვანთა წიგნები წარმოადგენს ხელოვნების ნიმუშს წიგნის სახით. ისინი ხშირად პატარა ტირაჟით გამოიცემიან და ზოგჯერ კი ერთ “უნიკალურ” ობიექტს წარმოადგენენ (ვიკიპედია). საღამოზე წარმოდგენილი იქნება Bent Books-ის (წიგნების სერია თურქეთიდან) და ქართველ ხელოვანთა მიერ შექმნილი ხელოვანთა წიგნების კოლექცია, რომელიც მოიცავს როგორც ახალ, ასევე ძველ წიგნებს. დამატებით ნაჩვენები იქნება ხელოვანთა წიგნები BAS- ის და გეოეარის/არქიდრომის კოლექციიდან. ბანუ ჯენეტოგლუ და ფილიპინ ჰოგენი გააკეთებენ მოკლე ისტორიულ მიმოხილვას ხელოვანთა წიგნებთან მიმართებაში, ასევე ისაუბრებენ თავიანთ გამოცდილებაზე ამ სფეროში. დიალოგში მოწვეული იქნებიან ადგილობრივი ხელოვანები, რათა გაგვიზიარონ თავიანთი დამოკიდებულება, მიდგობა ამ მედიისადმი და დააფიქსირონ თავიანთი პოზიცია ლოკალურ კონტექსტში. ხელოვანთა წიგნებს მიძღვნილი ღონისძიების ინიციატორები არიან ბანუ ჯენეტოგლუ და ფილიპინ ჰოგენი (Bent Artists' Books-ის რედაქტორები) გეოაერთან თანამშრომლობით. “Artists’ books are works of art realized in the form of a book. They are often published in small editions, though sometimes they are produced as one-of-a-kind objects referred to as “uniques” (Wikipedia). 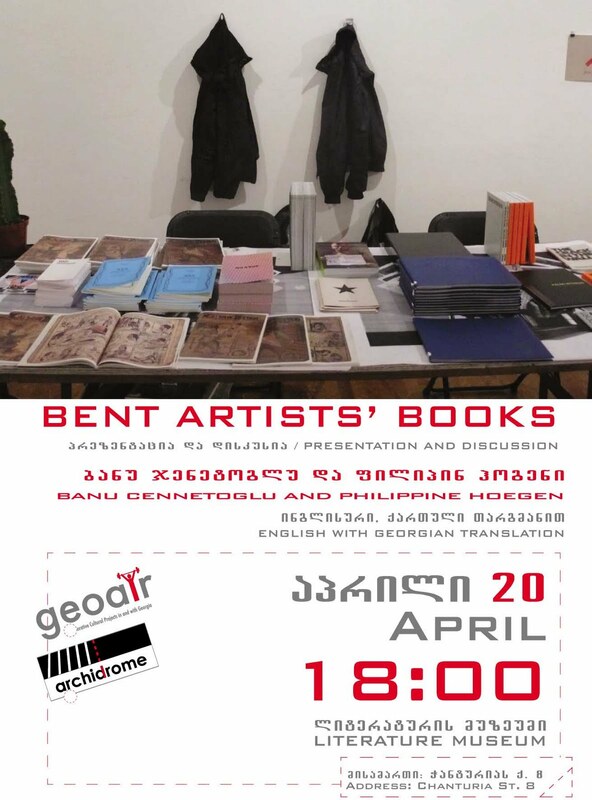 On view, will be the complete Bent Books (a series of artists’ books from Turkey), and a collection of artists’ books made by artists in Tbilisi both recently and in the past. Additionally there will be artists’ books from the BAS and GeoAIR/Archidrome archives. Banu Cennetoglu and Philippine Hoegen will hold a brief introduction to the history and context of artists’ books as they have experienced them. Then they will invite the artists’ present for an exchange with the audience on their books, their approaches to the medium and its position in the local context. This event about artists’ books is initiated by Banu Cennetoglu and Philippine Hoegen, editors of Bent Artists’ Books, in collaboration with GeoAIR. ბანუ ჯენეტოგლუ მუშაობს ფოტოგრაფიის, ინსტალაციის და ბეჭდვითი მედიის დარგში. ფსიქოლოგიაში ბაკალავრის წოდების მიღების შემდეგ, იგი სწავლობდა ფოტოგრაფიას პარიზში, 2002-2003 წლებში იმყოფებოდა რაიკსაკადემიის ხელოვანთა რეზიდენციაში, ამსტერდამი. 2006 წელს მისი ინიციატივით სტამბულში დაარსდა BAS, სახელოვნებო-საპროექტო სივრცე, რომელიც ორიენტირებულია ხელოვანთა წიგნების და ბეჭდვითი მასალების შეგროვებასა და წარმოებაზე. მისი ბოლო დროის გამოფენების სიაშია პერსონალური გამოფენა Guilty Feet Have Got No Rhythm, ბაზელის Kunsthalle-ში; Sample Sale, გალერეა Rodeo, სტამბული; მანიფესტა 8 (შირი ზინთან ერთად); ვენეციის 53-ესაერთაშორისო ბიენალე, თურქული პავილიონი (აჰმეტ ოგუტთან ერთად); სტამბულის მე-10 ბიენალე; ათენის 1 ბიენალე. ბანუ ჯენეტოგლუ ცხოვრობს და მუშაობს სტამბულში. ფილიპინ ჰოგენი მუშაობს ფოტოგრაფიის, ვიდეოს, ინსტალაციის, ტექსტის და ბეჭდვითი მედიის დარგში. იგი სწავლობდა ჰააგის სამეფო სამხატვრო აკადემიაში და მიიღო მაგისტრის დიპლომი პიტ ზვარტის ინსტიტუტში როტერდამი. 2004-2007 წლებში იგი ცხოვრობდა და მუშაობდა სტამბულში და იყო თანაინიციატორი ხელოვანთა წიგნების სერიისა სახელად Bent. მან დააარსა Calcite Revolt -პროფესიული გაცვლის პლატფორმა ხელოვანების, კურატორებისა და თეორეტიკოსებისათვის. იგი ასწავლის წმ. ჟუსტის აკადემიაში, დენ ბოშში, ჰოლანდია. მისი უახლესი პუბლიკაცია “სუპერსტრუქტურა”, კაროლინ სტიკერთან თანამშრომლობით, გამოცემული იქნა დორსკი მუზეუმის, ნიუ პალცი, ნიუ იორკი და ნიუ იორკის სახელმწიფო უნივერსიტეტის მიერ მათ გამოფენასთან "Inscription" ერთად. ფილიპინ ჰუგენი ცხოვრობს და მუშაობს ამსტერდამში. Banu Cennetoglu works with photography, installation and printed matter. After having a B.A in Psychology, she studied photography in Paris. Between 2002-2003 she was an artist in residence at the Rijksakademie, Amsterdam. In 2006 she initiated BAS, a project space in Istanbul focusing on collection and production of artists’ books and printed matter. Her recent exhibitions include Guilty feet have got no rhythm. / Kunsthalle Basel, Manifesta 8, Sample Sale / Rodeo, Istanbul, 53rd Venice Biennial, The Pavilion of Turkey (with Ahmet Ogut), 10th Istanbul Biennial, 1st Athens Biennial. Cennetoglu lives and works in Istanbul. Philippine Hoegen lives in Amsterdam. She studied at the Royal Art Academy in The Hague and obtained a masters degree at the Piet Zwart Institute in Rotterdam. From 2004 to 2007 she lived and worked in Istanbul and co-initiated with BAS the series of artists’ books called Bent. She is founder and board member of Calcite Revolt, a platform for professional exchange for artists, curators and theorists. She is a tutor at the St Joost Academy in Den Bosch, NL. She works with photography, video, installations, text and printed matter. Her most recent publication, a collaboration with Carolien Stikker, is "Superstructure", published by the Dorsky Museum, New Palz, NY and the State University of New York in conjunction with our exhibition "Inscription". Open Call for Artists' Books!!! ხელოვანთა წიგნები წარმოადგენს ხელოვნების ნიმუშს წიგნისსახით. ისინი ხშირად პატარა ტირაჟით გამოიცემიან და ზოგჯერკი ერთ “უნიკალურ” ობიექტს წარმოადგენენ (Wikipedia). ხელოვანებო საქართველოდან, რომლებიც მუშაობთ ამ სფეროში,გთხოვთ გამოგვიგზავნოთ თქვენი წიგნები გამოსაფენად. ყველა მიღებული წიგნი წარდგენილი იქნება გამოფენაზერომელიც გაიხსნება თბილისში 20 აპრილს. გამოფენაზე ასევე წარდგენილი იქნება BAS-ის კოლექციიდანარჩეული წიგნები და პუბლიკაციები. წიგნების მოწოდებისთვის დაგვირეკეთ 899677307. ჩვენიმისამართია: GeoAIR-ის ოფისი, ძმები ზუბალაშვილების ქ. 56/54შორის. გამოფენის შემდეგ თქვენი წიგნები, თბილისში GeoAIR-ისარქივის (Archidrome) ან/და სტამბულში BAS-ის არქივის ნაწილიგახდება. სხვა შემთხვევაში დაგიბრუნდებათ უკან, რისთვისაცგთხოვთ თან დაურთოთ თქვენი კოორდინატები. Opening on the 20nd of April, there will be an exhibition of artists' books in Tbilisi. We hereby invite artists from Caucasus region who work in this medium to send in a copy of their artist's book. All received books will be included in the exhibition. The exhibition is initiated by Banu Cennetoglu and Philippine Hoegen, editors of Bent Artists' Books*, in collaboration with GeoAIR*. The exhibition will also include a selection of books from the BAS* collection and publications. GeoAIR office is on Zubalashvulebi street between 54 and 56. 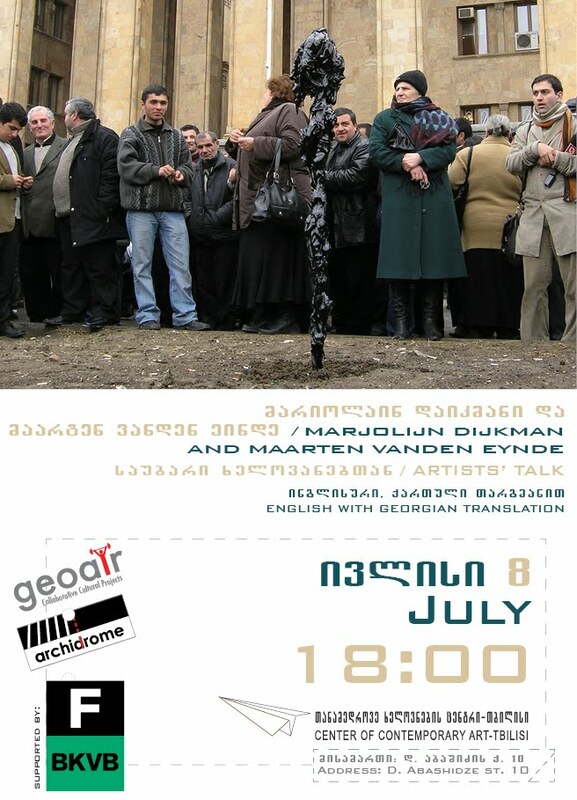 After the exhibition your book can become part of the GeoAIR archive in Tbilisi or it can become part of the BAS archive in Istanbul. Alternatively it can be sent back to you. In this case please add sufficiently stamped envelope with your name and address.